ApniTally Job service has received a very good response. We are receiving number of contacts of people. It is bound to increase as more and more people get positive responses from it. Now the main question is how to choose best people out of these candidates . This task would be more difficult as number of people would increase. 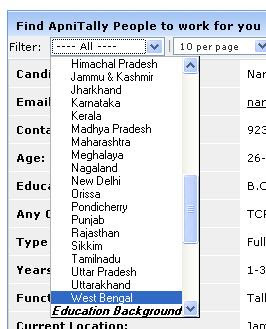 To help a selector we have provided many filters which can short list the candidates based on the search criteria. 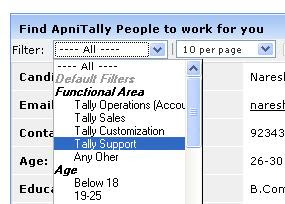 If you are a user of Tally software and facing any problem in operation then it can help you to find right person near you. If you are a user of Tally and want person to manage your accounts then also it can help. If you are a trainer and need any body to provide you training then it can help. If you are looking for a person to get your customization done then it can help you finding the right person. 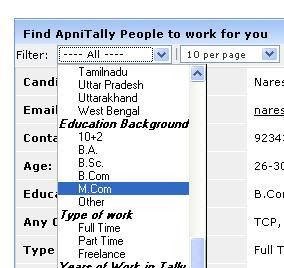 If you are a seller of Tally software and need suitable candidate then you can find help. What all these people have to do is to choose the right filter and the results would be narrowed down with suitable candidates. Lets take first type of a person who is using Tally software and have some kind of problem in operation and he needs any person near him who can either visit him or can guide him on phone etc. For this what he can do is find freelancers who are doing this type of job on consultation basis or he can filter records based on functional area like support. 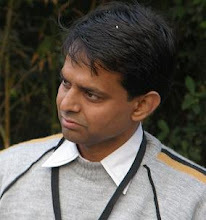 Similarly for a person who wants people for customization or for sales purpose then Filter Functional area is helpful. 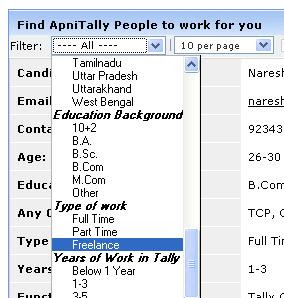 Other filters like Type of work, years of experience in Tally, age of candidate are also very useful to search the right candidate. Over all this service becomes and interactive platform where Tally Learners,Tally Partners, Tally Academies can submit their profiles or biodata and expose them to Tally Users. See how these filters work in the database below. please help me out in creating work contract sale. we are a contractor with service and material. how to make sale bill for the same. i have to make sale bill of 67% vat and 33% service tax.